Quality Patchouly oil with a wonderful healing, soothing & calming nature. The traditional warm earthy fragrance of Patchouli is renowned for its ability to balance depression, anxiety, lethargy, stress, tension & mood swings. Patchouly fragrance comes from Indonesia. Glass bottle of 1/4 ounce scented oil. 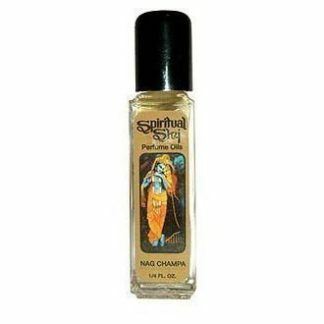 Spiritual Sky Perfume Oil – Patchouly. While oils are an excellent way to Enhance the mood in your home by creating Peaceful, Loving moments. Also did you know that the sense of smell triggers Sensual & Loving feelings, among many other things? It’s absolutely true – try it next time you’re wanting to create a romantic evening! Glass bottle of 1/4 ounce of premium scented oil. Therefore long lasting fragrances created from essential oils. Natural concentrated essential oils for body, bath, perfumery, and environmental scenting. Spiritual Sky perfume Oils are super concentrated, so just a little bit will go a long, long way!